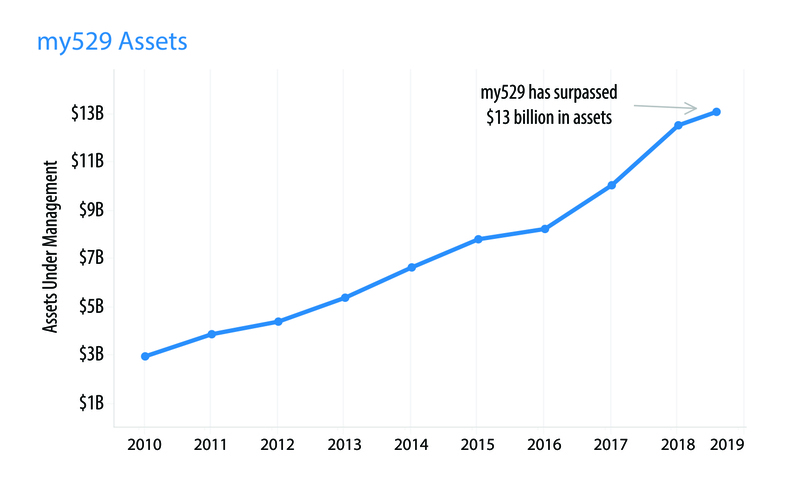 (Salt Lake City) my529, Utah’s official college savings plan, has surpassed $13 billion in assets under management, less than a year after reaching the $12 billion mark. The latest milestone for Utah’s educational savings plan indicates that families value investing for higher education. A 2018 report1 by Sallie Mae Bank showed saving for college was the third most important priority for parents after emergency savings and general savings but ahead of retirement savings. my529 experienced an 8.3 percent increase in assets under management since early January, when it hit $12 billion. The plan has nearly 375,000 accounts as of August 29, 2018, up from 355,000 accounts in January, a 5.63 percent increase. The rapid growth demonstrates my529’s strength in the industry. Out of 91 plans surveyed, my529 ranks as the nation’s fifth largest plan2, according to Strategic Insight, an asset-management research company. Asset totals are not the only factor earning my529 national honors. Utah’s official nonprofit educational savings plan is also one of four plans in the country that received the Morningstar Analyst RatingTM of Gold in 2017. my529 has achieved this coveted rating for the past seven years. Morningstar, an investment research firm, evaluated 62 plans in 2017 and recognized my529 in large part for its competitive fees, state tax benefits, and flexible investment options. The $13 billion in managed assets arrived shortly after the addition of a stable value fund to Utah’s plan. In August, my529 added the PIMCO Interest Income Fund to all age-based investment options and made it available to Customized Age-Based and Static investment options. For information and industry expert content, please contact us via Media Relations at 801.321.7161 to direct you to the right subject matter expert.